Beautifully engraved certificate from American Banknote Company issued no later than 1959. This historic document was printed by the American Banknote Company and has an ornate border around it with a vignette of an eagle. This item has the signatures of the Company’s Officers. Across the globe in private collections, in vaults, safety deposit boxes and even passed hand-to-hand in daily, common transactions, are thousands of pieces of valuable, fine art. These range from antique stock and bond certificates, traded and sought by collectors around the world, to the daily exchange of a high technology, hologram-bearing credit card. And while these art forms are diversified in function and form, each also represents a miniature example of the early engraver's art-raised to its finest level. They also document, in a living legacy, the growth and expansion of America's capital markets and represent one of this country's oldest, continuous corporate success stories-the American Bank Note Company. The American Bank Note Company traces its beginning back to 1795. This was the important midpoint of the decade following the ratification of the American Constitution, a time when there was a pressing need for regular banking service and for circulating bank notes. The place was Philadelphia and the man was Robert Scot. The Federally chartered Bank of the United States opened in 1791 in Philadelphia, and a mint was established shortly thereafter. Robert Scot was appointed its first engraver. In succeeding years, aided by Jacob Perkins, the Yankee inventor who advanced the art of engraving and platemaking, Scot formed the nucleus of what would later become the American Bank Note Company. In 1810, three Philadelphia engravers, with associations to Scot, formed Murray, Draper, Fairman & Co. The firm will be remembered for two fundamental contributions: (a) it established the value of combining art and technology as a bank-note safety measure, and (b) it established world supremacy of American steel plate engraving methods. The two contributions gained the organization significance in the era which began in 1823, an era which culminated 35 years later in the formation of the American Bank Note Company. During this period, two brothers, Cyrus and Asher Durand, created many of the innovations that characterize financial-certificate engraving even today. Cyrus is credited with introducing, or improving, many of the tools of the trade, including machines for engraving straight lines, wavy lines and ovals, as well as a pantograph size-reducing machine. Later, he also developed a transferring machine and a geometric lathe. Asher had a different claim to fame-he was the first to popularize Greek gods and goddesses in the vignettes (small pictures) in documents of value. These devices are of import in that they are hard to copy, their significance is recognized, they are aesthetic-and they are timeless. During this 35-year period, one of the predecessor companies to the American Bank Note Company produced the first issue of U.S. postage stamps. Another predecessor company established green as the "money color." The formal creation of the American Bank Note Company in 1858 was very well received by the banks and companies that were its principal clients because it promised the stability, continuity and security which users of documents of value had long desired. The next twenty years were eventful for the American Bank Note Company. In 1863, during the American Civil War, the U.S. monetary system was radically altered with the passage of the National Bank Act. Under the National Bank Act, locally issued bank notes were superseded by notes made under Federal control and direction. Two other important changes occurred with the issuance of legal tenders and National Bank Notes, with a portion of this business awarded to the American Bank Note Company. And the years following the war witnessed enormous industrial expansion with a corresponding rise in the use of engraved certificates for securities. Production of these notes was slow and costly, but nevertheless, the American Bank Note Company managed to turn out tens of millions of National Bank Notes each year, plus postage stamps and fractional currency, as well as securities certificates for public and private issuers. During the Civil War, the company's reputation for excellent quality work expanded internationally, and it began to receive major orders from foreign governments. These included Argentina, Brazil, Columbia, Ecuador, Greece, Italy, Peru, Uruguay and several British territories. These orders were for currencies and, occasionally, stamps and government bonds. The American Bank Note Company was thriving in the private sector, as well, during this period. In an effort to make its stock certificates as secure as possible against counterfeiters, the New York Stock Exchange issued a rule requiring that all certificates be engraved by some "responsible" party. In 1875, the Treasury Department's Bureau of Engraving and Printing was created to print all U.S. notes and securities, hence bringing this era of the company's history to a sudden close. However, the company consolidated its operations with those of another financial engraver, and the crises was overcome. In fact, the merger of the two companies created an institution that was even stronger, as the next decades would prove. The new American Bank Note Company prospered as the United States economy surged through the close of the 1800s. As the country took its place among the foremost nations of the world, much of the industrial expansion within America was based upon public financing. This required the printing of stock certificates and bonds in large volume, a substantial source of revenue to the company. Additionally, the company prospered during the 1880s, 1890s, and into the Twentieth Century from the increasing number of foreign governments using American Bank Note Company currency notes. In 1891, the American Bank Note Company introduced "planchette paper," paper containing colored paper discs rather than silk fibers or silk threads. These discs possess various characteristics, but all of them instantly reveal any counterfeit. This paper is supplied by Crane & Co., which also supplies the Bureau of Engraving and Printing with its currency paper needs. Today, this paper is known to millions around the world. Another innovation came in 1891, this one introduced by a long-standing customer of the American Bank Note Company, the American Express Company. The new product was the traveler's check, and it became a field in which American Bank Note soon became the pre-eminent supplier of engraved travelers check forms, incorporating a variety of safeguards against counterfeiting. Today, the American Bank Note Company supplies virtually all of the major U.S. banks with these forms. In 1893, the company designed, engraved and printed a notable series of postage stamps, known as the Columbian issue, to honor Christopher Columbus at the time of the Columbian Exhibit in Chicago. Following their date of issue, this series of 15 stamps became highly prized collectors items. The decades since 1911 have witnessed almost every imaginable sort of political, economic and scientific upheaval, including two world wars, several world-shaking revolutions, high prosperity, deep depression, the era of nuclear energy and the exploration of outer space. Old nations have disappeared and new ones have emerged. Through it all, however, the American Bank Note Company, founded on the premise of merging high quality art with technology, has survived. Today, the company is one of the three related companies that comprise United States Banknote Corporation, a holding company. (The company stock is traded on the New York Stock Exchange under the symbol IBK.) The two affiliated businesses are American Banknote Company Grafica e Servicos Ltd., the largest private-sector security printer in Brazil and American Bank Note Holographics, Inc., the world's largest producer of holograms for security applications. UBK's president, Ron Glover, says that American Bank Note continues to focus on the design, engraving and production of counterfeit-resistant documents of value, the printing of which remains a specialized niche within the printing industry. These documents continue to utilize special papers and inks, elaborate steel engraved designs and intaglio printing process. This "dry printing" method eliminated the need to add moisture before the press operation and to cope with the sheet distortion that resulted. The American Bank Note process requires the use of specialized printing presses which apply extremely high pressure to paper and ink, thereby creating the embossed effect. This high-technology innovation was of such quality that, eventually, even the Treasury Department's Bureau of Engraving and Printing adopted the process in the late 1950's. Complimenting its intaglio printing process, the American Bank Note Company also uses specially designed lithographic undertints, featuring fine-line workings in various colors. These workers create prismatic or rainbow effects with line-on-line and front-to-back registration which, with the further incorporation of proprietary ink and film manipulation, further enhance document security. The company continues to enforce high levels of security throughout all phases of manufacturing, storage and distribution. During the 1940s, the American Bank Note Company worked with American Cyanamid Company and Crane & Co., the company's paper manufacturer, to develop "Melamine" paper which provides increased resistance to folding, tearing, and rubbing, as well as the important quality of wet strength or resistance to wear when subjected to moisture. In more recent years, security printing and electronics have found many ways to join forces. Magnetic inks and character patterns that electronic scanners can read are making it possible to combine the safety and accuracy of steel engraving and printing with the high-speed, automatic handling characteristic of electronic processing. Recently, through its affiliate, American Bank Note Holographics, the firm has developed, produced and marketed holograms for use in a variety of anti-counterfeiting and commercial applications. These laser-generated, three-dimensional images can be permanently applied to a broad spectrum of products, including credit cards, drivers licenses and identification cards. Holograms can be verified by sight without any special viewing equipment or machinery, and greater security can be easily achieved by adding hidden information to the hologram visible only with the aid of special devices or combining holograms with machine-readable information, such as bar codes or magnetic strips. Since its inception, the American Bank Note Company has developed an extensive library of engraved dies, rolls and plates used for printing and reprinting stock and bond certificates, banknotes and other documents of value utilizing the intaglion method of printing. The company's library enables it to create intaglio printed documents quickly and cost effectively in response to customer demands. It employs state-of-the-art computer composition, design and imaging capabilities in order to process design changes and to create new designs more economically and rapidly. It is generally acknowledged that its combination of intaglio printing equipment, proprietary anti-counterfeiting technology, computer composition capabilities and library of engravings makes it the leading security printer in North America. The company's current product line includes United States Department of Agriculture food coupons, postage stamps, stock and bond certificates for many of America's 17,000 publicly traded companies, travelers checks, foreign currency, passports and various commercial documents of value, such as gift certificates, coupons, bank checks and other bank documents. The great age of the company raises the question: "what does the art of survival consist of?" It certainly means flexibility and remaining alert to current and future opportunities, calling upon a history of innovation and a ready responsiveness to the dual challenges of an evolving society and an evolving economy. It means reorganizing, reincorporating and realigning operations; adapting to new conditions and entering new markets when old ones decline and disappear. American Bank Note Company president Glover said, in a tribute to perseverance and endurance, that the company will celebrate its bi-centennial this year, saying that two hundred years in business is a monument to the courage, agility and resourcefulness of a company's people and their commitment to quality, security and serving the needs of their customers. The milestones and monuments of this American enterprise are unique. 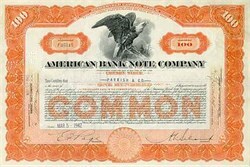 Unlike some companies where cornerstones or tall buildings are symbols of success, the on-going legacy of this company is literally in the hands of millions, in the form of stock certificates for today's investors, traveler's checks, individual credit cards with holograms, and in the private collections of 18th and 19th century financial memorabilia found around the world.